In The Toltec Secret author Sergio Magaña Ocelocoyotl shares the most ancient traditions in Mexico. Magaña’s mission in life is to take the secret knowledge of Mexican ancient dreaming and perceptual practices out into the world. He states that it is impossible to understand this mission without taking into account the land of Mexico itself so introduces The Toltec Secret with the fascinating tale of, not just the official story of the sixteenth-century conquest of Mexico, but also the oral tradition which gives a different account, one in which the world of dreams is extremely important. The introduction is followed by the story of Magaña’s ancestors – in line with the ancient Mexican belief that your story or flower begins to form before you were born and therefore the story of your life makes no sense without telling the story of your ancestors. Born in Mexico, of mixed Spanish and Mexican heritage, Magaña received training in indigenous wisdom since early childhood, beginning with his nanny and he was later initiated into the ancient Toltec lineage of Nahualism, the Nahuatl tradition including the Tol lineage of dream work which was passed down orally from master to student. The Toltec Secret is also a very useful ‘how to’ book containing numerous practical exercises and guidance. These include information on expanding consciousness, how to become a dreamer, dream interpretation and Tezcatlipoca (the Smoking Mirror) about the results that can be obtained working with the obsidian mirror. There are lots of exercises for the reader to try in Xayaca (the Masks) as well as five sets of breathing exercises to start your lucid dreaming training and sow dreams and The Chac Mool, exercises on working with a rain container. Magaña states that: “Being Mexihca doesn’t mean being born in a particular land. In the dream world there are no borders, so if you start doing the exercises in this book you’ll turn into a Mexihca and be part of a group that acknowledges the power of dreams and is trying to control that power”. 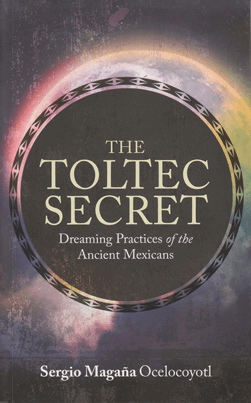 An excellent very informative book – if you are interested in learning more about the dreaming practices of ancient Mexicans or in becoming Mexihca this is definitely the book for you!